The MacIntyre Gazette is distributed to the towns of Inglewood, Texas, and Yelarbon and their associated mail runs. 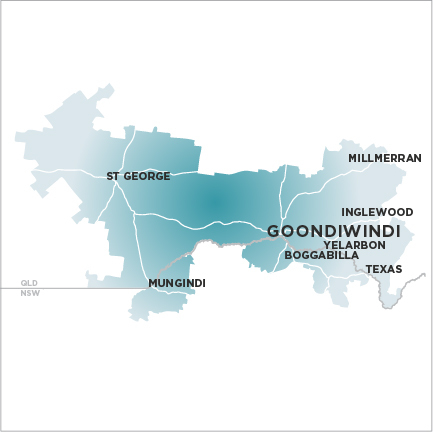 Distribution covers the Inglewood Shire and portions of the Warwick, Waggamba and Inverell shires. This district is known for its relaxed lifestyle in a rural atmosphere, away from the pressures of city life, but still within a comfortable driving distance. Two irrigation schemes provide water for agricultural and horticultural crops. Cattle, sheep and other livestock enterprises contribute significantly to the local economy. The district also has a cypress and hardwood timber industry. New rural enterprises are emerging including corporate olive groves, stone fruit orchards, vineyards and wineries. The MacIntyre Gazette circulates through the Inglewood area including Bonshaw, Gore, Inglewood, Karara, Omanama, Subscriptions, Texas, Yelarbon and Yetman.